Several members of the Committee on Global Thought participated in the new event series Raising the Bar, which hosts talks by professors in bars around New York City. Carol Gluck and Joseph Stiglitz spoke to sold-out crowds with the aim of spreading knowledge and shaking the city’s nightlife culture. Paige West had worked rooms like this as a bartender, but never as an academic. A professor of anthropology at Columbia University and Barnard College, Ms. West found herself on a recent rainy Tuesday night standing in the center of a dimly lit, long, narrow space in Pouring Ribbons, a second-floor bar on Avenue B in the East Village. She was here to talk about the cultural and economic importance of surfing to the people of Papua New Guinea. It was a tough room. She was stationed by a banquette, and about half of the audience sat behind her. The microphone cut out intermittently. A few members of the crowd chatted by the bar as they sipped beer and mixed drinks. She had to compete with the clatter of ice in a cocktail shaker. She soon found her groove. She asked the crowd to describe the images that came to mind when thinking about Papua New Guinea. “Tribal people,” one person said. Ms. West was participating in an unusual, student-led experiment that brought nearly 50 faculty members, most of them from Columbia and New York Universities, to bars throughout New York City on one night last week to discuss their research. The event, dubbed Raising the Bar, was slicker than the average student-run affair. It attracted corporate and media sponsors. Several professors said they were impressed by the students’ entrepreneurial energy and logistical skill. Yali Saar, a sophomore in Columbia’s School of General Studies who served as the event’s creative director, had hoped it would appeal to those who had graduated from college and found they missed the intellectual stimulation. The demand amazed him. Through word of mouth and social media, the event sold out in a day. The exchange can cut both ways. Carol Gluck, a professor of history at Columbia, discussed the place of memory in World War II, and why that conflict continues to exert a pull on the public imagination. It is a subject she has explored in many venues, both locally and abroad. When she does so in public forums, she said, some audience members have a visceral and personal response. 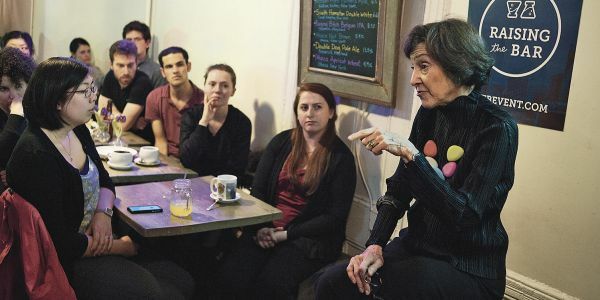 At Ciao for Now, a restaurant and bar in the East Village, she introduced her talk by describing how Russia’s efforts to seize Ukraine resonated with World War II. Even the accusations each side hurled at the other—of nationalism, fascism, and anti-­Semitism—echoed that conflict. His grandmother’s account was an example of what Ms. Gluck described as the “vernacular terrain” of memory. Shaped by popular culture and family stories, that kind of public memory is strong and often reassuring. But it can also be simplistic, narrow, and contrary to what she called “good” history. “It’s incumbent upon us to see things from different points of view,” she said to about 40 people as she sat on a stool in front of an exposed brick wall. A plate with the words “BEEF STEW” painted on it hung behind her. A refrigerator hummed in the kitchen. To choose the roster of speakers, students invited faculty members whose research seemed interesting and whose teaching was well reviewed on the institutions’ student course evaluations. While several professors, like Joseph E. Stiglitz, the Nobel Prize-winning economist, were renowned, others were lecturers. The topics ran the gamut, including autism, economic inequality, engineering human tissue, North Korean literature, and the physics of elementary particles. The students’ requests to the professors they wanted to participate had an earnest quality. They said they hoped to turn New York City into a giant campus. The professors could talk about anything they wanted. While no one would be paid, the speakers would get free travel to the event, along with complimentary food and drink. The professors ate it up. Most of the professors were intrigued by the opportunity to informally engage with the public. But even though the bars would close, or block off space for the talks, some scholars remained wary of the event’s unpredictability. “My first inclination was to say, ‘Absolutely not,’” said Kaiama L. Glover, an associate professor of French at Barnard whose talk focused on the stigmatization of Haiti in the global imagination. She ignored the first request she got. Impressed by the students’ persistence and organization, she changed her mind. After arriving at Tarallucci e Vino to deliver her talk, Ms. Glover drank a glass of wine to calm her nerves. There was no lectern, so she grabbed a menu to help her hold her notes. She relaxed and started speaking to her audience of about 40 people. At his talk, David Madigan, executive vice president and dean of the faculty of arts and sciences at Columbia, found himself in spirited debate with his audience. Mr. Madigan, a statistician, stood on the stage in a corner of the cavernous basement under the Idle Hands bar, on Avenue B. He described how statistical imprecision and shoddy oversight can lead to overstated claims in drug studies. Forty percent of studies he looked at, for example, could have yielded either positive or negative findings, he told the crowd of about 60 people, most of them sipping beer, some munching from hummus platters. Several audience members challenged him on his methodological critiques, while others asked about factors, like the profit motive, that might influence how analyses are conducted. One speaker railed against efforts by the pharmaceutical industry to make minor changes in patents in order to extend them. “It’s not an evil-corporation problem,” Mr. Madigan said. It was a scientific one. Unbowed, the audience member pressed his case. “That’s well outside the scope of what I’m talking about,” Mr. Madigan said. “No, it’s not,” the audience member shot back, then retook his seat on a bar stool.